An old microphone stands alone, just waiting for some company. A song is played and the room lights up. A delicate design of the classical icon, the Shure 55SH brought to fame by The King of Rock and Roll himself, Elvis Presley. Another expression for Music is Life. 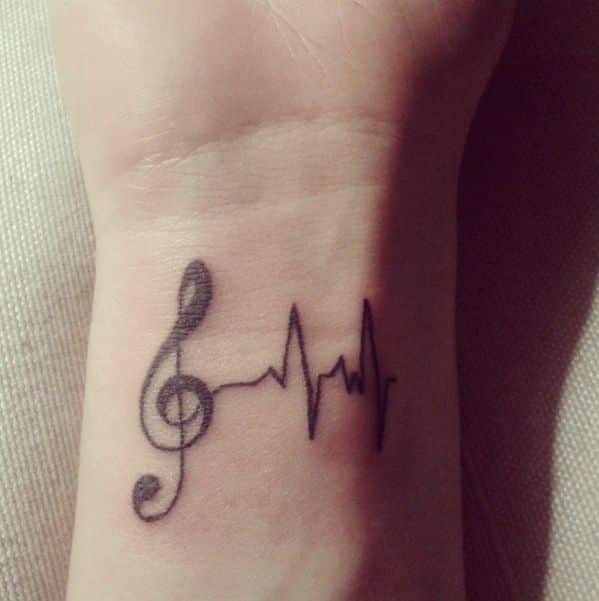 This piece of art displays a beating heart-rate line coming out of a G-clef. As long as there is music out there, we can never truly die, our lives are never-ending tunes in the world. Our hands are better used when creating art and music. 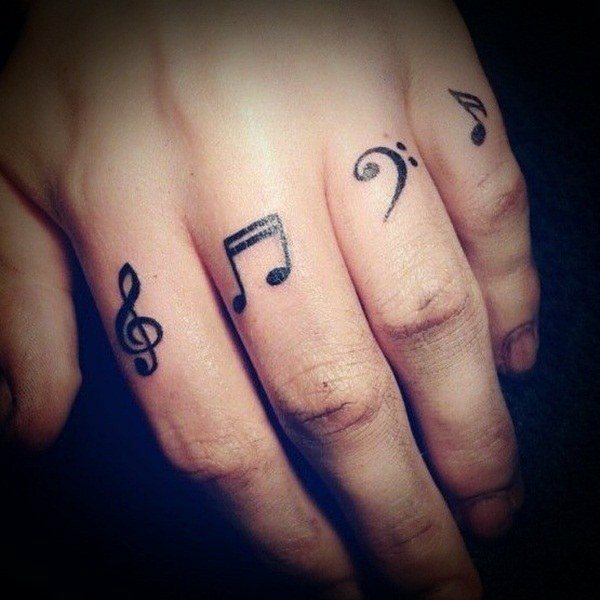 So why don’t bring that expression to your knuckles, adorning them with a G-clef, a double quaver, an F-clef, and a single quaver. They’re simple yet meaningful. 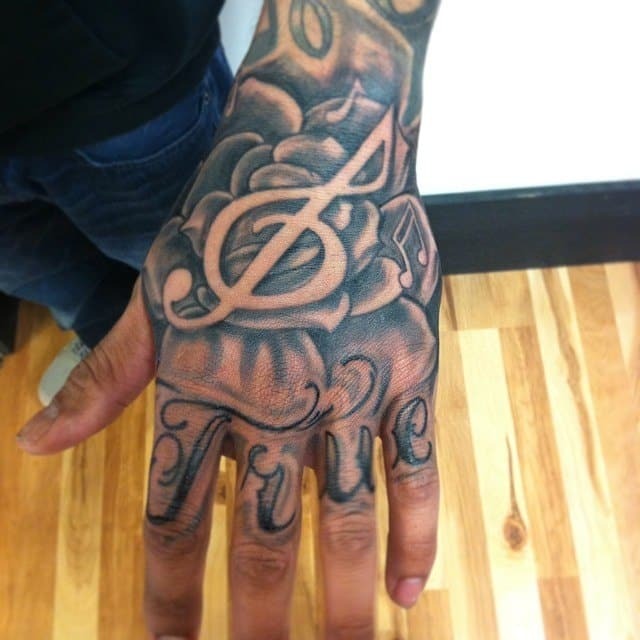 A message that reads: “True” on the knuckles. 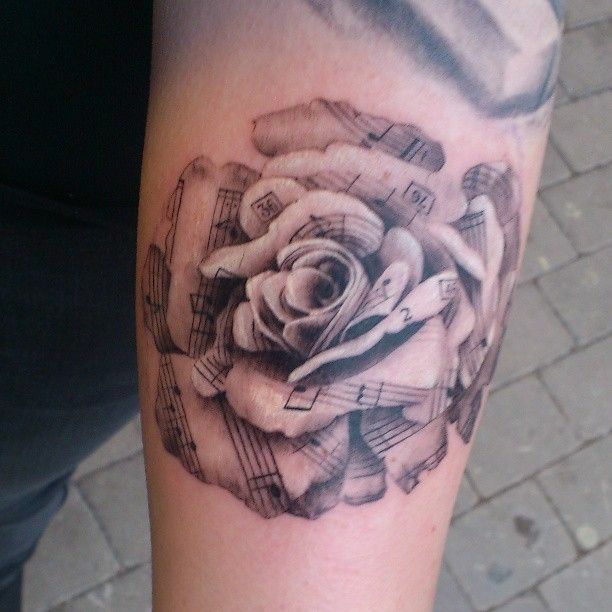 This ink is cleverly laid out so that you can clearly see a G-clef in-lined and left untouched on the wrist, over a background drawn with a rose in bloom and some other musical notes just floating around. 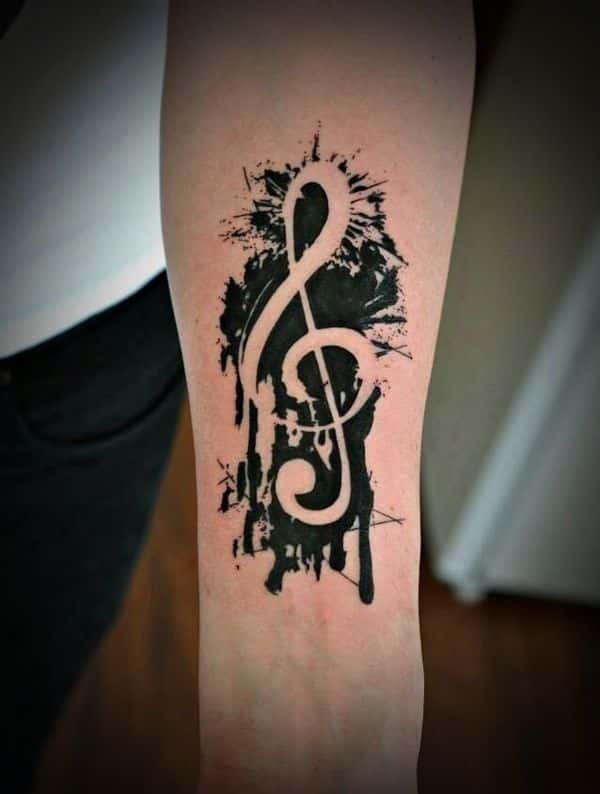 Following the in-lined tattoo designs we have a bold G-clef left alone, and what appears to be the aftermath of a bucket of black paint being thrown into a wall or a mirror, but magically leaving the clef untouched and standing. 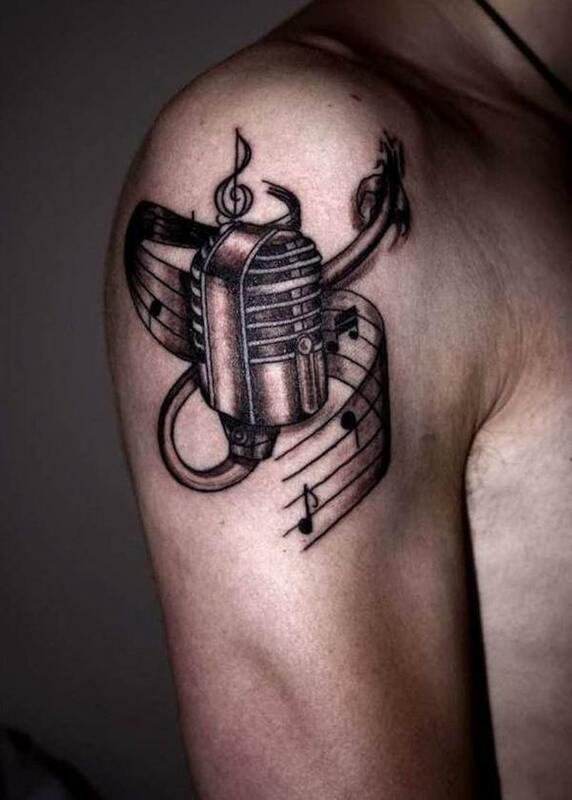 One of the best music tattoos for men out there. An F-clef on the left side of the chest, drawn by broad, brute, splashy strokes, leads the musical charge for a pentagram to follow its path all over the left arm. This work is a fine piece of art. A blooming rose, starts showing different pentagrams and musical notes on each petal. It is as though each petal carries along its own song, just waiting for the perfect moment to play them. What is one without the other? 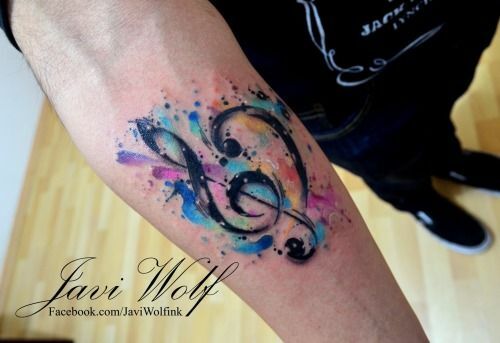 A G-clef faces an F-clef in what appears to be an aquarelle storm, full of different colors, brought to life by the magical touch of the sound of music. Where others see gray, we see colors. A hero can never get enough accolades and tributes. 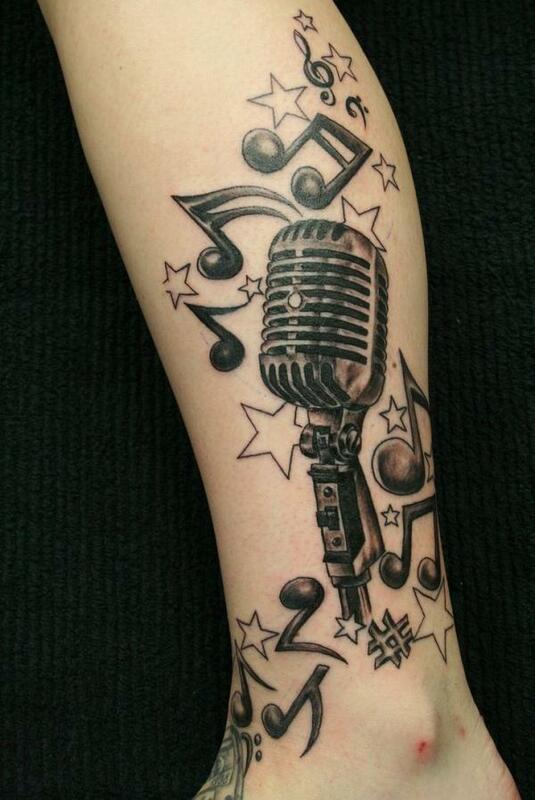 In this version, the Shure 55SH tags along some cartoonesque musical notes, clefs, and stars. It doesn’t matter what the weather forecast says for today, music will get you singing in the rain. Dwelling at the very center of the back, there’s a lonely heart. But is it? 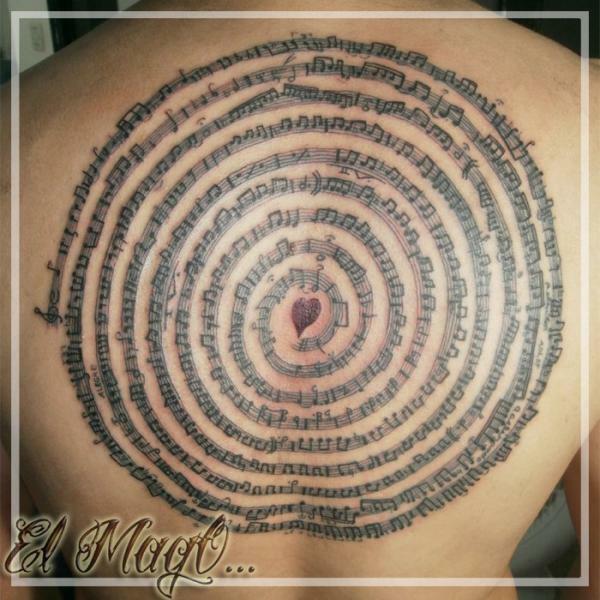 Music is born from it, and rapidly spreads and fills the entire space where it resides. Single tunes and full songs alike, they light up our moods.